This Product has been customized/built in the USA. This 100 or 150 GPD (your choice) RO seven stage system will provide top quality water. Clear housings, on the three pre-filters, not only make this unit sparkle, this feature also takes the guess work out of replacement of filters. Kills 99.9% of harmful bacteria E Coli, Coliforms, Viruses Fungi, Algae, Spores etc. And the DI unit will take the TDS down to near zero. 7 Stage Reverse Osmosis System. 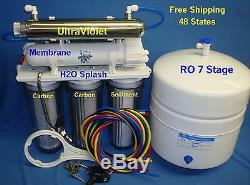 This sale is for one (1) seven stage reverse osmosis system. The system includes either a 100 or 150 gallon per day membrane. This system includes a 100 or 150 GPD membrane, membrane housing, flow restrictor, one sediment filter and clear housing, two carbon block filters and clear housings, one ultraviolet unit, one in-line DI, one in-line carbon filter, 3.2 gallon tank, saddle valve kit, flow restrictor , automatic shut-off valve, fittings, check valve, tubing, faucet kit, and filter wrench. This is an assembled complete system (ready to be installed) and we send the installation instructions to you after the sale. Special Note 1 : All of the housings (sediment and carbon filter) are standard 10 inch clear housings with 1/4 inch thread inlets and outlets. Clear housings will permit you to observe the filters and thereby allow you to monitor the depletion of the filters. This will take the guess work out of when to replace your filters. Model Flow Rejection Diameter Length Test Conditions Temp. RE1812-24 24 gpd 98% 1.8 inches 12 inches 60 psi / 250ppm 25 C / 77 F.
RE1812-35 35 gpd 98% 1.8 inches 12 inches 60 psi / 250ppm 25 C / 77 F. RE1812-50 50 gpd 98% 1.8 inches 12 inches 60 psi / 250ppm 25 C / 77 F. RE1812-80 80 gpd 98% 1.8 inches 12 inches 60 psi / 250ppm 25 C / 77 F. RE2012-100 100 gpd 98% 2.0 inches 12 inches 60 psi / 250ppm 25 C / 77 F. RE2012-150 150 gpd 93% 2.0 inches 12 inches 50 psi / 100ppm 25 C / 77 F.
The stated product performance is based on data taken after 30 minutes of operation at the following. 250 mg/L NaCl solution at 60 psig (0.41 MPa) applied pressure. Dry type elements are vacuum leak tested using the San Diego Protocol. Permeate flow rate for each element may vary but will be no more than 15% below the value shown. All elements are packaged in a polyethylene bag containing 1.0% SBS (sodium bisulfite) solution. Element configuration: Spiral-Wound, Tape Wrapping. Model A B C D E. 87 inch 11.73 inch 1.77 inch. 47 inch 11.73 inch 1.91 inch. A Diameter of center feed post. Length from end of feed post to membrane wrap. C Over-all length from end of feed post to end of Permeate post. D Diameter of membrane wrap. E Length from membrane wrap to end of Permeate post. This 10 inch sediment filter is made of 100% high purity polypropylene, surfactant free, binder free and adhesive free. This sediment has a special design to trap particulates. 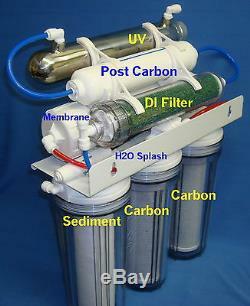 Sediment filters are in compliance with FDA requirements and they are NSF Standard 42 certified. They have great particle holding capacity and are being used in a variety of applications such as pre-filters for reverse osmosis systems, pre-filters for water filtration units, aquarium pre-filters and being used as sediment collectors for whole house systems. The carbon block filters are manufactured with high purity Coconut Shell activated carbon with extruded activated carbon block construction. They do not release carbon fines and they are FDA compliant and they are NSF certified. These solid carbon block filters have combined the adsorption capability of carbon, with the ability of a solid block material to selectively strain out particles from the water that is being forced through the filter. Activated carbon has an electro-positive charge added which results in this type of carbon attracting more chemicals and impurities. As the water passes through the positively charged carbon, the contaminants with their negative ions, are attracted to the carbon granules and thus extracted from the water. The block of carbon strains out sediment, dirt, bacteria, microscopic worms, algae, asbestos and cryptosporidium. With just water pressure, this compacted solid carbon block is designed to filter sub micron size particles. This microstraining of the water will provide the cleanest and clearest drinking water available. Activated carbon bonds to thousands of known chemicals. As water is forced through this solid block of carbon, it is forced to slow its flow speed and thereby increase the contact time with the carbon. This slowing of the flow allows the carbon bonding to take place and remove chemical pollutants like toxins, THM's, chlorine, pesticides, bad tastes, odors, etc. Solid block carbon filters are very uniform and do not channel or bypass as conventional granular activated carbon (GAC) filters are know to do. Because of the density of the solid block carbon filters, there is no room for bacteria to grow, so these filters do not become an incubator for bacteria as GAC filter are known to be. These carbon block filters will fit most types of 10 filter housings on the market today and as noted previously, they will fit into the housings on nearly all water filtration and reverse osmosis systems. Carbon block filters preform well in both commercial and residential applications and they are the most widely used carbon filters on the market today. 10 DI Refillable Filter In-Line Housing With DI Resin. This sale is for one (1) 10 inch refillable in-line Filter Housing with 6 ounces of DI (Deionization - Demineralized) mixed bed resin installed. Reverse Osmosis units are capable of removing up to 98% of the TDS (Total Dissolved Solids). If your water usage requires zero (0) TDS, this 10 refillable in-line will provide the quality of water you are seeking. This DI in-line Filter Housing is compatible with RO systems and will polish the water to the highest quality of zero (0) TDS if the starting feed water TDS is 200 TDS or below. Regular testing and replacement of the DI resin is required to obtain the lowest TDS readings. UV Ultraviolet Light (Sterilizer) with UV Lamp Ballast. Ultraviolet is recognized as superior compared to other methods of disinfection. There are no dangerous chemicals to handle or monitor. UV has a low initial system cost and a very low cost of operation. There are no byproducts from the UV process, and nothing is discharged into the environment. UV causes no change to the taste or odor of the water disinfected. It is impossible to over-treat water with UV. UV systems are very easy to install and maintain. UV disinfection is compatible with all other forms of water treatment. The water enters an ultraviolet sterilization chamber where any viruses, bacteria, mold, and other living microorganisms are bombarded with special, intense light of a specific wave length. The UV light penetrates the wall of the organisms and attacks their DNA structure leaving the organism unable to reproduce (or "dead"). UV technology is recognized by the EPA as one of four approved methods of sterilizing water, and is preferable over the other three methods (chlorine, iodine, and distillation) due to the cost of treatment and effectiveness of UV (UV works almost instantaneously, leaving no residuals or chemicals in the water). This UV module operates for a full year at 30,000 microwatt seconds/cm². As a point of reference, the table below is a list of common bacteria and viruses, and the dosage required to render them harmless. Subtilis spores, Clostridium tetani, Corynebacterium diphtheria, Dysentery baccili, Eberthella typhosa, Escherichia coli, Leptospira, Micrococcus candidus, Micrococcus sphaeroides, Mycobacterium tuberculosis, Neisseria catarrhalis, Phytomonas tumefaciens, Proteus vulgaris, Pseudomonas aeruginosa, Pseudomonas fluorescens, Salmonella, S. Typhosa, Sarcina lutea, Serratia marcescens, Shigella dysenteriae, Shigella paradysenteriae, Spirillum rubrum, Staphylococcus albus, Staphylococcus aureus, Streptococcus hemolyticus, Streptococcus viridans, Vibrio cholerae. Mucor racemosus A, Mucor racemosus B, Oospora lactis Penicillium expansum. Coli, Hepatitus virus, Influenza virus, Polio virus. Bakers' yeast, Brewers' yeast, Common yeast cake, Saccharomyces cerevisiae, Saccharomyces ellipsoideus, Saccharomyces sp. The life of a UV bulb is determined by the turbidity of the water, content of the contaminants, consistency of electric current and usage. The inline filter is manufactured with a high performance granulated activated carbon that polishes the product water as it moves from the storage tank (on your reverse osmosis system) to your usage point. All of the sediment and carbon filter housings are standard 10 inch clear housings with 1/4 inch thread inlets and outlets. This is a 3.2 gallon storage tank (with tank valve) which is NSF rated and FDA approved. The bladder is food grade material and it has been pre-charged with air (no adjustments required) and ready for service. As noted above, this is a complete system including installation instructions (emailed). We install these units daily. Where you will find over a dozen different sizes and types of whole house units - single housing, dual housing and triple housing units - slim line, standard and Big Blue housing types - clear, blue or white - a size and type to fit everyones needs. To see Reverse Osmosis systems of various capacity and types - we do not offer one RO system that fits all, rather we offer a variety to permit you to select a system that meets your specific needs. Should you need to upgrade your current RO system, we have packages to make the upgrade easy for you to complete. We are offering you products that we believe in and use everyday in our water serving operation which covers several states. Compare our prices - we can offer quality products at better prices because of volume usage. For the last 28 years we have been servicing water equipment in several states. During this time we have used thousands of sediment and carbon block filters - we are offering you products we have used over the years and found to provide us the quality of service life our customer have come to expect. When we started in the water business in 1984, many of our competitors were still drinking chlorinated water. We are a member of the Water Quality Association (WQA is an international organization) and we adhere to the code of ethics of this the premier water organization in the world. The item "7 Stage(100/150GPD)RO DI UV Reverse Osmosis System Water Filter Clear H2O Splash" is in sale since Tuesday, May 24, 2016. This item is in the category "Home & Garden\Kitchen, Dining & Bar\Small Kitchen Appliances\Water Purification\Water Filters". The seller is "h2osplash" and is located in Great Bend, Kansas.